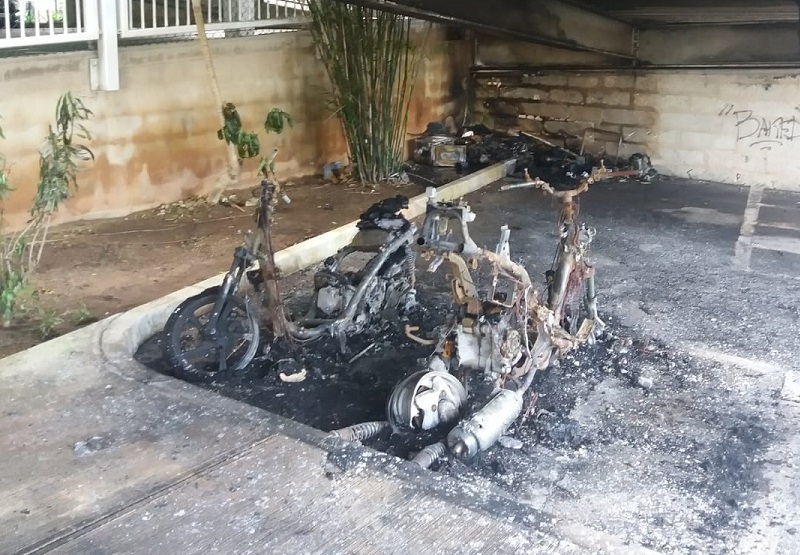 [Updated] Emergency service personnel responded to the Bulls Head Car Park in Hamilton at around 5:30am this morning [July 21] as “three motorcycles were set on fire,” the police have confirmed. A police spokesperson said, “Bermuda Fire and Rescue Service and the Bermuda Police Service responded to a report of an incident that took place at 5:30 this morning [Saturday] at the ground level of the Bulls Head Car Park in the City of Hamilton. “Upon the arrival of the emergency service personnel, it was ascertained that 3 motorcycles were set on fire. However, the fire was subsequently extinguished by the BFRS. “An investigation into this matter is now underway and police would like to speak with anyone who may have seen someone in the area acting suspiciously. “Anyone with any information on this incident is asked to contact 295-0011,” the police added. Update 11.50am: The Corporation of Hamilton said, “The City of Hamilton can confirm that a suspicious fire took place in Bull’s Head overnight. Emergency responders attended the scene where bikes and propane cylinders had been set afire. “The fire has caused damage at the western end of the lot and affected ramp access from the ground floor to the additional floors above. The incident is under investigation and a structural engineer is on site today to assess the damage. “There have been no injuries associated with this incident and the City will update the public as more information is made available. Now , now . We can’t do that . Softly , softly you know . I’m sure to COH has cameras, I mean it is a pay car park. The CoH more then likely does not have cameras. All this money they are charging people. They should have had cameras and right now they better get them installed for a while host of reasons with safety being paramount. So the unemployed are entitled to act destructive because of the economy and destroy other people’s hard earned property ? By your logic I dread to think what the next 5 years will bring .